Our local Good Friday moment, this may be one of the workings of the year at Eastleigh. 20205 + 20189 0Z12 16:35 West Ruislip Lul Dept Gbrf - Eastleigh Works Gbrf, although in practice the locomotives were left in the sidings adjacent to the station. Unusually, both locomotives arrived cab forward. 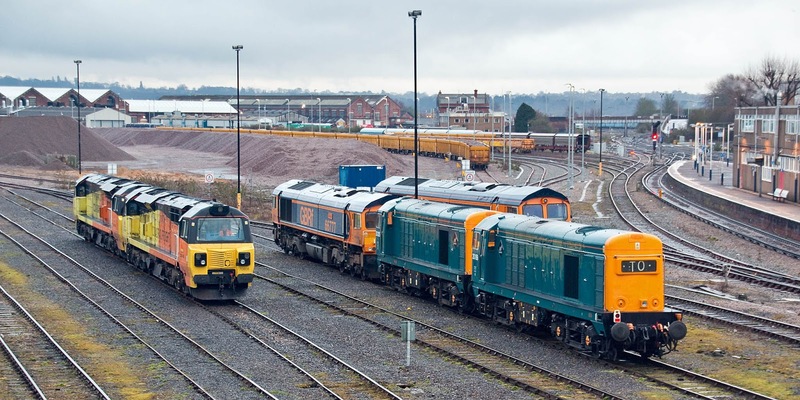 70812 + 70808 at left, 66777 beyond the pair of 20s, and 66723 behind. Arrival after running through the yard. The pair are now parked. 20205 runs on a mix of fluted (right) and plain (left) compensation beam bogies, the latter from the pilot scheme batch of 1957 - 58, thus now 60 years old. 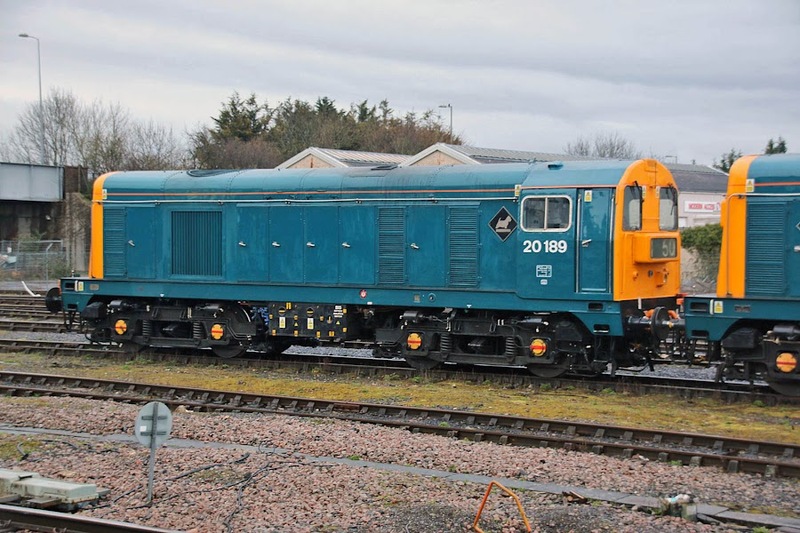 20189 was new as D8189 in January 1967, from English Electric at Newton-le-Willows. Renumbered January 1973. 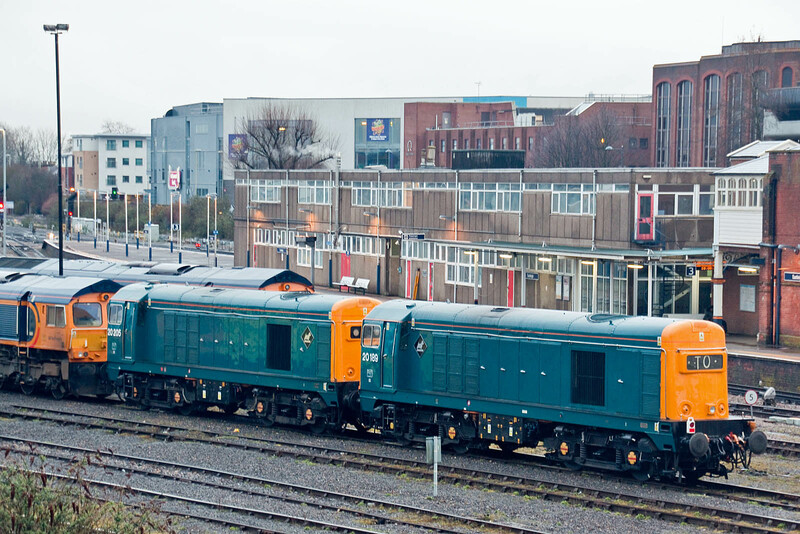 For many years allocated to Toton, it was dual braked at Glasgow Works in July 1983, afterwards allocated to Eastfield, also then to Motherwell, later back to Toton. It was withdrawn in September 1990, with disposal to M.C. Metal Processing at Glasgow, where it became yard shunter. Later it worked on the Channel Tunnel Rail Link (HS1). In private ownership it has been itinerant, being noted for periods on the Weardale and Embsay railways, as well as on London Underground (L189). 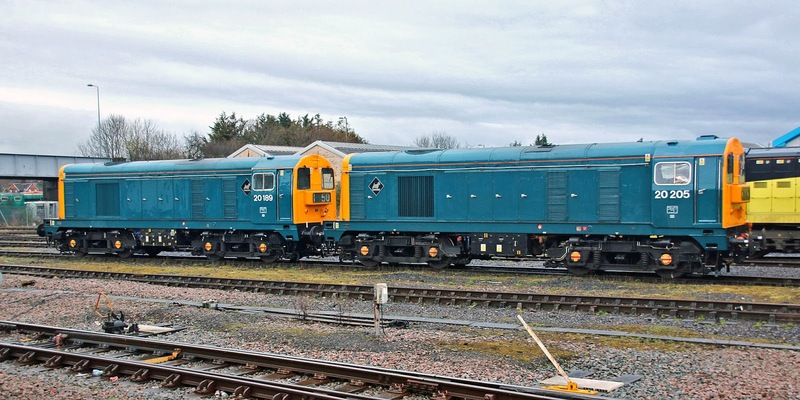 In 2013 it visited the Swanage Diesel Gala, and later spent a period in Balfour Beatty colours. 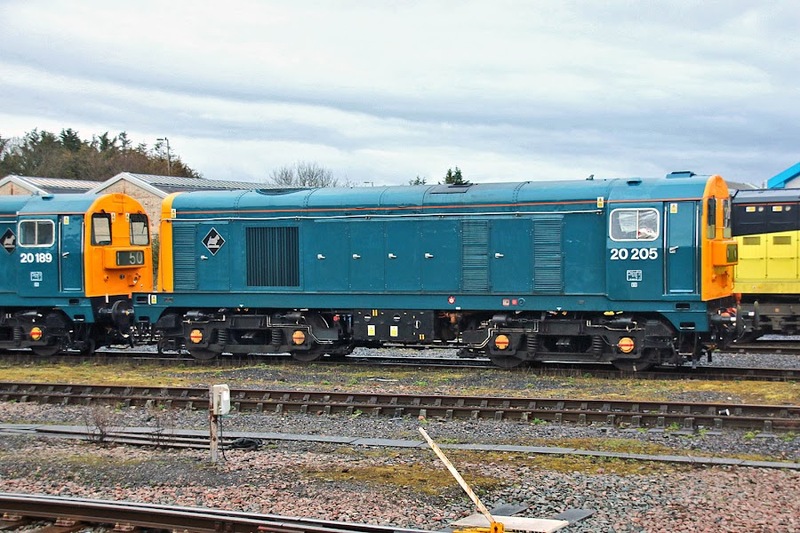 In the ownership of Michael Owen's Class 20189 Ltd (pool code MOLO), with base at Butterley. I first saw this locomotive on 5th January 1985, it would appear to have been in Edinburgh or Carstairs area on a WCML Cross Country return trip to the South of England. 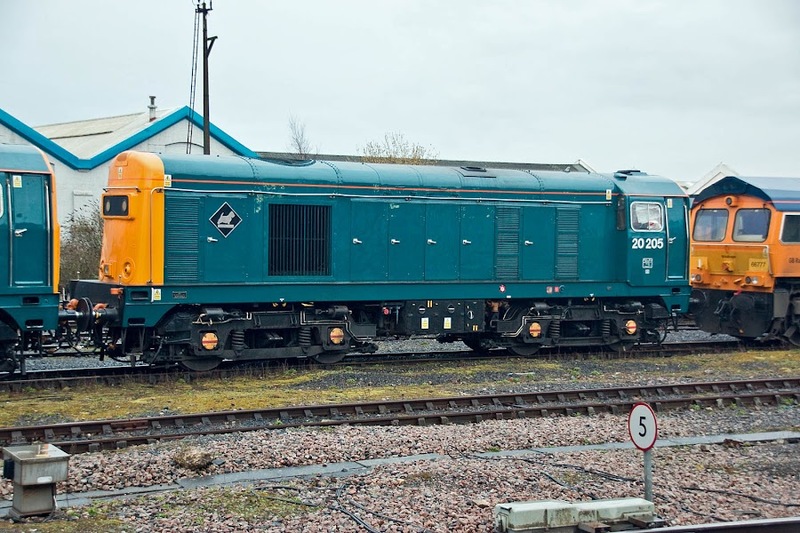 20205 was new as D8305 in April 1967, renumbered in January 1973. 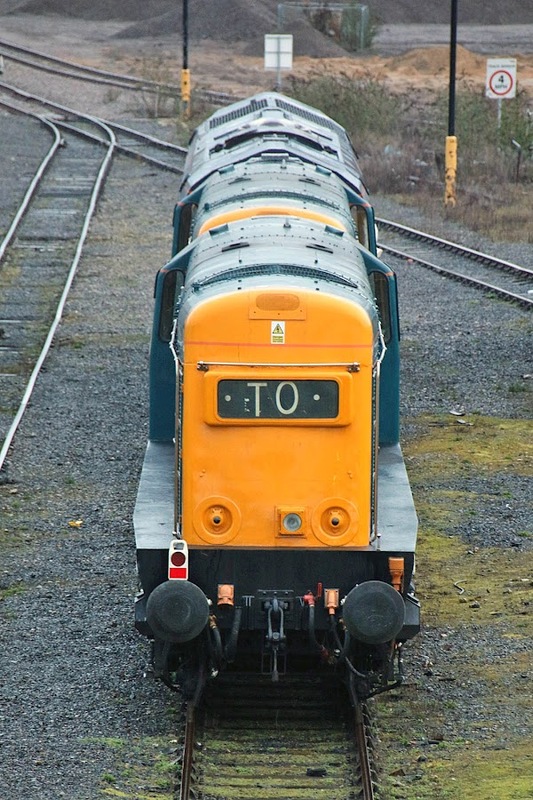 Delivered to York North, now the NRM, it later worked from Tinsley from 1971, then Eastfield from December 1976. Dual braked in 1977, in 1978 period it was reallocated to Haymarket, then in 1986-87 reallocated to Eastfield and later Thornaby. Withdrawn in December 1989, it first made its way to the East Lancashire Railway, then later to the Midland Railway Centre. Restarted in 2014 at Butterley, and returned to mainline use in 2015 (also pool code MOLO). In the ownership of the Class 20 Preservation Society, based at Butterley. I first saw this locomotive on 18th September 1978, at Burntisland, likely either around the dock or on a Seafield merry-go-round, when allocated to Haymarket. Shots from the bridge were taken in low light after sunset. 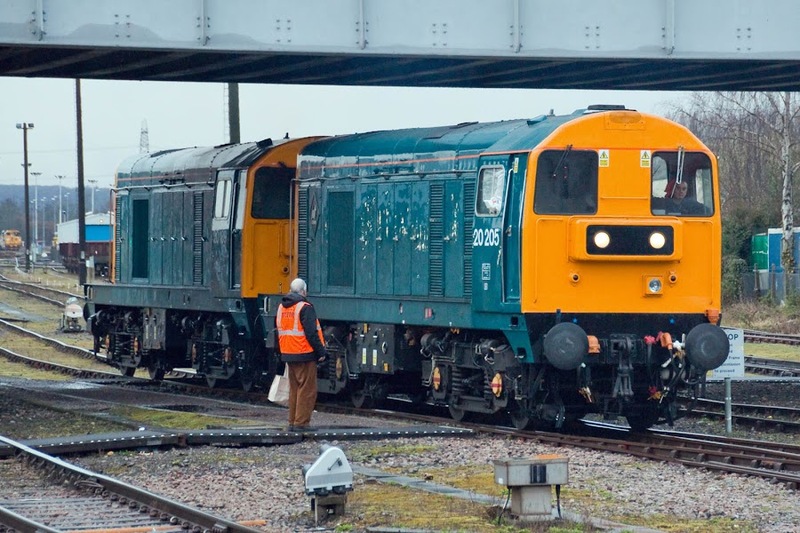 20189 + 20205 are planned to perform at the West Somerset Railway Diesel Gala on 8th - 10th June. Next move on Saturday 7th ?